Do You Remember... "Black Saddle". Perry Mason and other lawyers were popular on TV in contemporary settings but were slow to invade the TV West. Only five come to mind—Tom “Sugarfoot” Brewster, “Temple Houston”, “Dundee and the Culhane”, Richard Long on “Big Valley” and Peter Breck as Clay Culhane, reformed gunfighter turned lawyer on “Black Saddle”. After both his brothers were killed in a gunfight, Culhane decided to look for other solutions in settling frontier problems. Becoming a lawyer, with his law books in his black saddle, Culhane settled in Latigo, NM, quickly becoming friends with Marshal Gibson “Gib” Scott (Russell Johnson) and Nora Travers (Anna-Lisa) who owned the Travers House hotel. (This origin, or background, was revealed in the second season episode “The Saddle”.) Although Culhane always put his faith in his law books first, invariably he was forced to resort to gunplay to see justice achieved—reaffirming violence as a key ingredient of the TV western. The 30 minute black and white series, produced by Four Star, premiered Saturday nights on NBC from 9-9:30pm on January 10, 1959. Even though preceded by “People Are Funny” and “Perry Como” and followed by “Cimarron City” (w/George Montgomery), “Black Saddle” faced stiff competition from “Dancing Party” on ABC and “Gale Storm–Oh Susanna!” on CBS. Also, CBS had the established Saturday night western lineup of “Wanted Dead or Alive” at 8:30, “Have Gun Will Travel” at 9:30 and “Gunsmoke” at 10. “Black Saddle” and “Cimarron City” were simply out-gunned. Dropped by NBC in September ‘59 after 20 episodes, ABC took a chance with lawyer Culhane and picked up “Black Saddle” for Friday nights from 10:30-11pm beginning on October 2, 1959. But again, even with strong lead-ins from “77 Sunset Strip” and “The Detectives”, Culhane and friends were shot down by Friday Night Boxing on NBC. 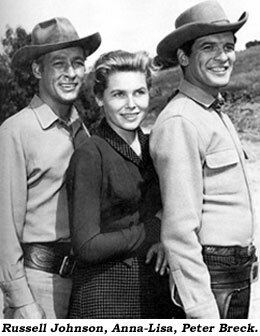 Also in those days, many network affiliates pre-empted certain series in favor of syndicated programs, so “Black Saddle” was often pre-empted in many markets by “Sea Hunt”, “Markham”, “Shotgun Slade”, etc. “Black Saddle” was created by Hal Hudson (1908-1999) who was also producer for Four Star’s “The Westerner” and “Zane Grey Theatre” and by John McGreevey (1922-2010) whose career stretched back to 1948. 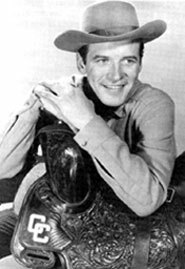 McGreevy wrote all types of material including westerns such as “Tombstone Territory”, “Broken Arrow”, “Colt .45”, “Zane Grey Theatre”, “Trackdown” and many of the “Black Saddle” scripts. Following “Black Saddle” he worked on “Bat Masterson”, “Laramie”, “Laredo”, “Wagon Train” and dozens of non-westerns through ‘97. “Black Saddle” was produced by Antony Ellis who was primarily a writer (“Zorro”, “Zane Grey Theatre”, “Northwest Passage”) and after “Black Saddle”, “Temple Houston”, “Man Called Shenandoah”, “Monroes”, “Gunsmoke”. A good series and even with top-name guest stars like Clu Gulager, Phyllis Coates, R. G. Armstrong, Robert Blake, James Coburn, Scott Forbes, Warren Oates, Simon Oakland, L. Q. Jones, Lisa Gaye, Michael Pate, James Best, James Drury, Madlyn Rhue (in season one) and Suzanne Pleshette, John Lupton, Patricia Medina, Charles Aidman, Buddy Edsen, Lee Van Cleef (in season two), “Black Saddle” never quite found a devoted audience and was not renewed by ABC. The late Peter Breck (1929-2012) found lasting TV western fame on “Big Valley” in ‘65 while Russell Johnson (1924-2014) subsequently became famous as the professor on “Gilligan’s Island”.